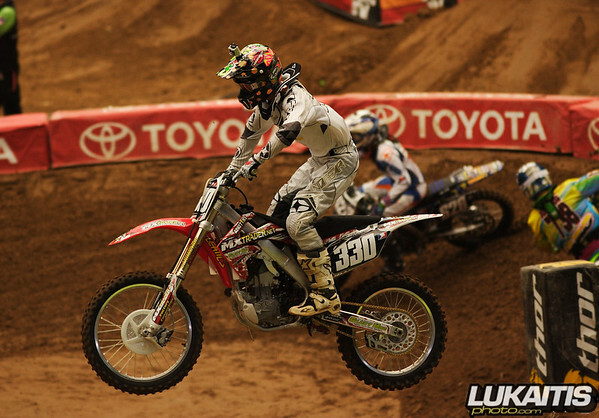 Here is a great story about AJ Catanzaro’s first American Supercross race this past weekend in Houston. AJ was backed by former NJ resident Rudy Schellenberger’s company www.mxtrader.net Show Rudy some support after you read the article below. A couple of weeks ago, AJ Catanzaro did not have a motorcycle to ride, but after submitting a desperate post on Facebook, his dream of racing Supercross came true by a company that also is trying to make an impact in the industry, MXTrader.net. The team challenged the Supercross Lites class on a stock bike that came directly from the showroom floor. Besides a re-valve service from Factory Connection, the only modifications performed on the bike were to the sprocket and grips. Yet, this young and upcoming rider made it to the main comfortably, well as comfortable as his nerves would let him. He admits that his biggest obstacle is overcoming his nerves, but knows that his nerves will fade with experience. Here is what he had to say about racing in his first Supercross race in the U.S.
How was your first Supercross race, well, in the U.S? Yeah, oh man, it was awesome. At practice, I was so nervous. I never have been so nervous, because I did not know what to expect. I walked the track and was looking at it, and was like this is pretty intimidating. Then I got out there in first practice and felt comfortable right away. I was just having fun and the whole night just followed from there. The main did not go as smoothly as I wanted, but hey, I was in the main. I couldn’t ask for much more. What were your expectations when you first got there? Well, looking at some of the names, which I probably shouldn’t have done, my goal was to make the night show at first, because I knew there were 80 guys there trying to make the night show. Once I saw my qualifying time, I knew I was going to make the night show. From there my goal was just to make the main. So, I was just kind of taking it one step at a time and learning it as quickly as I could. The bike is awesome. I mean it’s completely stock, but we just threw on a sprocket on there, grips and a seat, and that was it. I felt really comfortable. It’s probably one of the slowest bikes out there, but I think that’s good because it’s going to make me work harder and will make me that much faster when I get put on one of those faster bikes. How did you hook up with MXTrader.net? I actually posted on my Facebook, maybe two weeks before Houston, if anyone was out there that is willing to help me out. I was kind of desperate for a bike. If I did not have a bike, there was no way I could race Supercross. And, right away Rudy (owner of MXTrader.net) sent me a message on Facebook to give him a call. So, I called him up and sent him my resume and two days later he’s going to get my bike. I definitely can’t thank him enough. Without him, I would not have been at Houston. So what are your goals or plans this season? I want to make every main and I like to be a top ten guy. I want to finish top ten in points and I think that is pretty reasonable. I am known for being consistent and I know a lot of these kids aren’t. I’m going to learn fast. I am going to try to qualify in the top 10 in Atlanta and go on from there. What do you need to compete in the top 10, or maybe top 5? Do you think you can run in the top 5? I think anything is possible really. If you watch the race in Houston, it’s crazy. There is stuff going on everywhere on the track. My bike is at a little disadvantage, but I don’t let that bother me. I think that I could get more out of the stock bike if I just don’t get nervous and ride like myself. Then I think I could be top ten, top five, and who knows, maybe on the podium depending on how things go. What have you learned from your first race? Well, I started out front in the heat race and the main, so I think that helped me deal with being out front. And it was tough; I was really nervous. I just didn’t run with myself, but I think the more I am up front the more I will learn how to be upfront. I mean, the whole environment, with all the fans watching, it was a pretty crazy experience. But I am going to learn quick. Yeah, I bet that was a bit intimidating seeing all that action there. 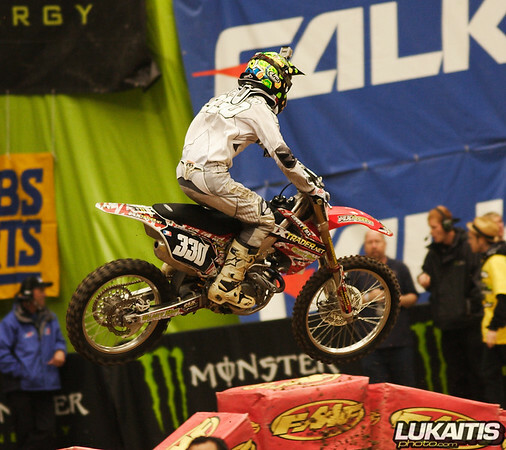 How did Houston compare to racing Supercross in Germany? It was kind of the same deal, but nowhere near like the Supercross here. I think Houston sits between 60-70 thousand people. In Germany, I think the biggest one is at 15 thousand. But it seems a lot more because everyone has air horns and stuff so it’s like there’s a couple hundred thousand in there. They got their little chainsaws, air horns, and it’s just nuts. Germany was really good. There was like 15 to 20 American riders over there. A bunch of guys over there made the 450 class at Houston. (Laughs) Yeah, in Europe, they have chainsaws without the blades but it just makes that sound. And that’s what those guys do over there. The air horns and those are really popular and it’s nuts.